Blog Picasso Trigger (Rhinecanthus aculeatus) Fishkeepers Guide! I don’t know about you but I just adore a species of fish that is different, strange, even wacky in some way? Be it their behavior, their looks, or maybe even both, there is something very attractive about an oddball fish! The Picasso Triggerfish (rhinecanthus aculeatus) fits incredibly nicely into the oddball category in several ways. Be it their weirdly painted appearance, their strange vocalization, or just their often unpredictable behavior, they are truly one of a kind. 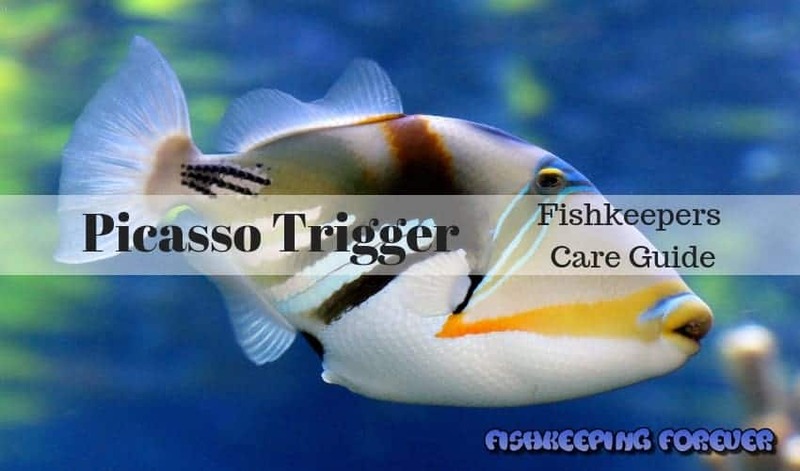 They are also incredibly easy to care for as you will discover with our Picasso Triggerfish essential care guide. It is rather fitting with its abstract colors and patterning that this species would be named after the great Spanish painter Pablo Picasso. After all, both are full of color and vibrant. In fact, the Picasso Triggerfish is so vibrant that it ranks highly, if not top, of the list of highly exotic fish. Found fairly frequently in Hawaiian waters the Picasso Triggerfish is commonly referred to as the Humuhumunukunukuapua’a, trying saying that quickly five times! This literally translates into ‘triggerfish with a snout like a pig.’ Not the finest of names for this exquisite looking specimen I’m sure you’ll agree. This species may also, though there is some debate over it, be Hawaii’s state fish. Care wise the Picasso Triggerfish is not difficult to keep providing its principal requirements are met. On a very basic note, this would mean providing them with a larger than average aquarium, feeding them a good healthy and nutritious diet, and ensuring they have plenty of rocks, caves, and overhangs to retreat to for sleep and security. For more basic care information please see the table below. Humu Picasso Triggerfish, lagoon triggerfish, blackbar triggerfish. The Picasso Triggerfish has a laterally compressed body with high set and independently moving eyes that are positioned far back on their heads. 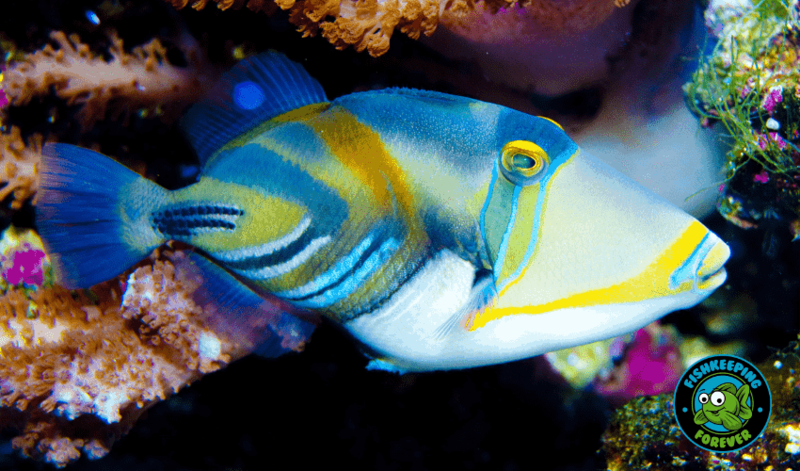 Regarding their vision, much research has been done with the results suggesting that the Picasso Triggerfish has trichromatic vision just like humans. In simple terms, this means that they possess three independent channels for conveying color information. Just like other members of the triggerfish family, the Picasso Triggerfish has a stout first dorsal spine that can be locked into an upright position. They use this to lock themselves into caves and crevices so they cannot be removed by predators or faster moving water currents in their natural environment. If they get chance, they will also erect their dorsal spines to warn off predators and interlopers encroaching on their territory. For a larger species, up to 10 inches, the Picasso Triggerfish has a deceptively small forward set mouth. They also have a good old mouthful of sharp teeth, useful as they are predatory carnivores, that any keeper will need to be wary of. Colour and pattern wise, saving the best for last, the Picasso Triggerfish has a tan body with gradient dark bands. On the top of their head, there are vibrant black and blue stripes. Cheek to cheek runs a bright yellow stripe that kind of looks like a badly applied and smeared lipstick. As previously mentioned the Picasso Triggerfish can be found in the waters of the Indo-Pacific from South Africa to the Hawaiian islands. They prefer reefs and sandy areas in their regions and will usually be found singly or in small groups. As they are territorial singular is the more common living situation, though juveniles may be found together. Being highly territorial the Picasso Triggerfish will usually be found restlessly swimming around their selected area vigorously protecting it. They will do this aggressively and forcefully especially when they are guarding eggs. Many curious divers have been on the receiving end of this aggression with the Picasso Triggerfish occasionally taking a bite! Interestingly, this species territories can overlap usually with a male being surrounded by females. By natures standards, this is an exceptionally good living situation as harem breeders. Should one female die or move out of her territory, another will quickly move in. Feeding wise the Picasso Triggerfish is a predatory carnivore that will eat just about anything that comes their way. This includes sponges, stony corals, mollusks, crustaceans, worms, brittle stars, sea urchins, and smaller fish. If you’re looking for a species that will always play nicely in your community saltwater aquarium then the Picasso Triggerfish may not be for you. They are fairly aggressive, will defend their territory to the hilt, and may even eat smaller aquarium mates. Please don’t let this put you off keeping this spectacular specimen, however, as get the mix right and they are amazing. Believe it or not, after the aggression message, the Picasso Triggerfish is actually one of the more easygoing trigger species. They are not only full of color but full of personality too. Well known for their bull in a china shop approach to their aquarium decor, rearranging everything in their path, you will have fun seeing what their next decor move will be. Though it would be fun to think that the Picasso Triggerfish rearranges their aquarium because they want to design their own home, it’s unfortunately not true, as far as we know. Rather, they are looking to create shelters and safe spots where they can sleep and retreat to. They will do this in one of two ways; either by blowing jets of water out of their mouths to create depressions in the sand or by swimming sand away. This they do by placing their mouths against solid objects and swimming like crazy. This creates a current that takes the sand away and makes little nesting areas. Picasso Triggerfish are also incredibly curious and will investigate their keepers intently learning to recognize them over time. This can lead to them even becoming hand tame and begging for food from you when you approach. Be aware though that it is not advisable to hand feed as they may confuse your fingers for a tasty snack. Other tasty snacks to a Picasso Triggerfish include aquarium tubing, heaters, and their cables, and internal filtration. These are not snacks you want them to be having so take care when placing these items. As juveniles, Picasso Triggerfish are a lot more amenable than when they are adults. Aggression grows in them as they age. This aggression will take the form of raising their spines erect as a warning whilst grunting. Yes, Picasso Triggerfish are vocal, which let’s be honest makes them even cooler! They will also chase and bite when the need arises. Aggression, however, isn’t the Picasso Triggerfish default position when it feels threatened. Their preferred method of dealing with danger or perceived danger is to retreat. They do this by going into crevices, caves, or under overhangs, and attaching themselves by their dorsal spine. This means that they cannot be pulled out of hiding by predators but rather remain safe. Picasso Triggerfish also retreat into these spaces when they are sleeping which is quite often done on their sides. Being a rather large saltwater specimen at up to 10 inches the Picasso Triggerfish requires a large aquarium of around 180 gallons or 680 liters. The temperature within the aquarium should be 72-78℉ or 22-26℃ with sg of 1.020-1.025 and dKH between 8-12. Decor wise the Picasso Triggerfish is best kept in an aquarium with a sandy substrate and plenty of places to retreat to. These can include caves, crevices, and overhangs which can be built into a marine rock display. Lettuce like faux corals with interstices are also good spaces for the Picasso Triggerfish to retreat to. Due to their ability to rearrange their aquarium space, you should ensure that rocks and ornaments are secure so the Picasso Triggerfish cannot hurt themselves by knocking them over. Take care also where you place your aquarium equipment as this species has a tendency to bite and chew on them. As Picasso Triggerfish are highly active, they also need plenty of space to swim around in as well as their hiding spaces. Providing this will also enable them to establish a territory which is highly important to this species. The territory also reinforces the need for the Picasso Triggerfish to have a large aquarium as they establish large territories. Picasso Triggerfish are not compatible with other triggerfish species and nor will they tolerate another Picasso in their aquarium unless there is plenty of space for them both to establish territories. This would, however, require an enormous aquarium too big for many home fish keepers. They should also not be kept in reef aquariums or with smaller fish as they will feed on small species, invertebrates, and other reef dwellers. Susceptible to most saltwater diseases the Picasso Triggerfish will require excellent aquarium maintenance. After all, it is quite often poor water quality that causes our fish to become sick. Common ailments include marine ich, dropsy, hole in the head, velvet, and black ich. Luckily, if your Picasso Triggerfish does fall ill, they respond well to most medicines and treatments. Read our complete guide on Tropical & Saltwater fish diseases here. 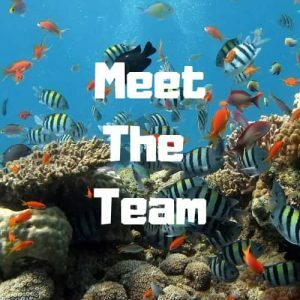 As with any species of fish you choose to add to your saltwater aquarium, you should take care to pick a healthy specimen from a reputable source. It is also advisable to quarantine your new Picasso Triggerfish for 2-3 weeks before adding them to the main aquarium. Once quarantined you should use the drip acclimatization to transfer them to their new home. Food wise, Picasso Triggerfish are easy to please and should be fed a varied meaty food diet. They require feeding well, preferably three times a day and need monitoring carefully to ensure they do not become underfed. Signs that they need feeding more are the back muscles and stomach looking pinched in. If you notice either of these signs, increase the amount of food you are giving or times per day you are feeding. As stated previously the Picasso Triggerfish will eat anything that comes their way and have big, healthy appetites. Food should be offered three times a day and if you notice a sunken back muscle or belly, feeding should be increased. Mine loves to eat Green Seaweed stripes that I held in place with a plastic fish food clamp. I use the Omega One Super Seaweed. To keep your Picasso Triggerfish healthy and happy you should offer it a varied meaty diet which could consist of squid, krill, clams, small fish, mysis shrimp, cockles, and mussels. Frozen foods with marine algae and green foods are also suitable. To keep their teeth from overgrowing hard shelled shrimp are a necessity too. In most cases, it is incredibly hard to tell male and female Picasso Triggerfish apart until they breed. Little, however, is known about the reproductive habits of this species as they do not breed in home aquariums. What we do know has been learned from observing them in their natural habitat. As stated earlier the male Picasso Triggerfish live in large solitary territories that overlap with multiple, 2 or 3, female ones. This aids them greatly since they are harem breeders and is probably why they do not breed in captivity. We cannot replicate their natural environment. Spawning between the male and female Picasso Triggerfish occurs at dawn with the resulting fertilized eggs hatching at sunset on the same day. The mother is solely responsible for the care of the eggs and will fan them throughout the day with her pectoral fins as well as guarding them vigorously. Extreme care needs to be taken when choosing tank mates for Picasso Triggerfish. As stated before they are not reef compatible, other trigger species compatible, or same species friendly. Smaller fish will also be in danger with this species as they will probably become a tasty treat. Species that are compatible with the Picasso Triggerfish need to be equally, or more aggressive, and of a similar size. Moray eels, groupers, snappers, the large angelfish, surgeonfish, rabbitfish, and lionfish are all good choices. 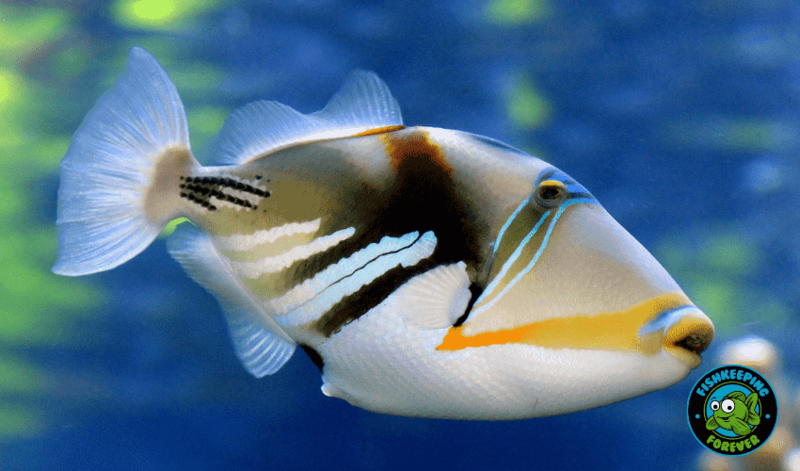 The main concern when considering adding a Picasso Triggerfish to your aquarium has to be whether or not you can offer it a home that is large enough. After all, not everyone has room in their home for a 180 gallon plus aquarium and it would be unwise to keep them in anything smaller. There is also the issue of aggression in the Picasso Triggerfish and that it is not suitable for reef environments or those with smaller, less aggressive fish. This is an important factor to take into account but can be easily solved by simply choosing other species of a similar size and as feisty. At the end of the day, the Picasso Triggerfish is well worth building the rest of your saltwater aquarium around. They have everything that a fish keeper could desire. They are a mix of a fabulous coloration that is vibrant and a showstopper, and a personality that is full of aggression and pleased to see you swagger. They are one heck of an exotic showstopper that every saltwater aquarium should have! 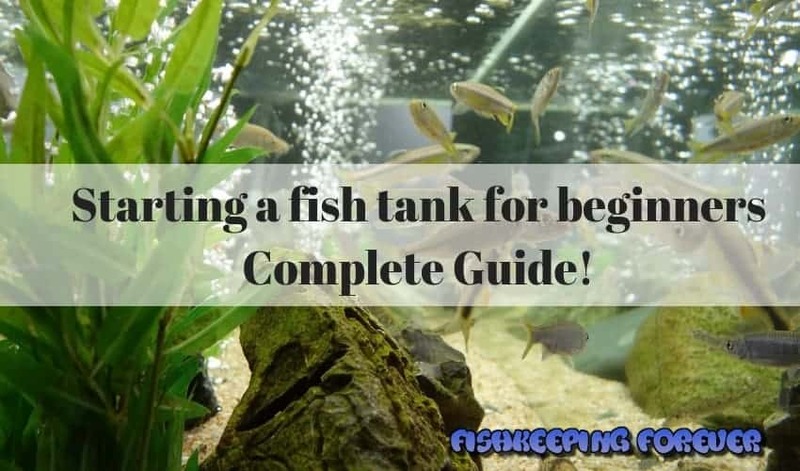 For those of you just thinking about starting your first aquarium you may find our article on Aquariums for Beginners really helpful. Just click the image below to be taken to the article.